Well, it's a New Year, but we're not leaving this holiday behind before we meditate on the Pracinky, a faintly chocolatey, faintly clovey Czech Christmas cookie that looks like a rolling brown mountaintop dusted with snow. 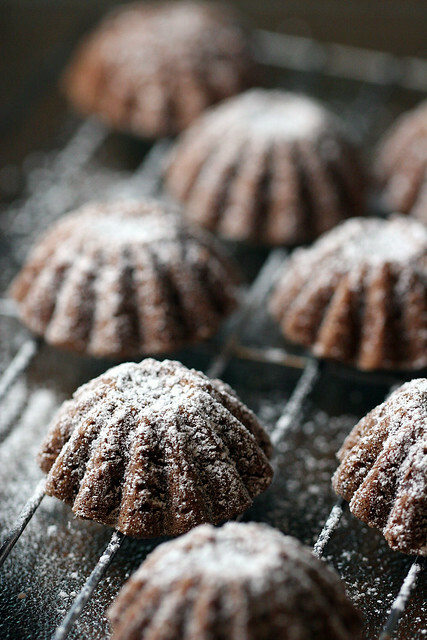 They are a Furbacher classic, and after a series of family emails and recipes tossed back and forth in December (and because my mom gave me her molds), I decided to give them a go this year. 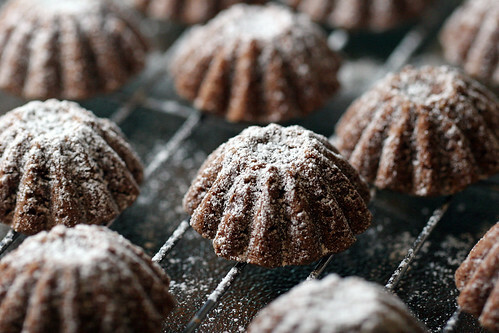 My dad translated his aunt's recipe for this -- ingredients including flour, butter, icing sugar, ground nuts, cocoa, cinnamon and ground cloves. Icing sugar by virtue of its name is over there [in North America] thought about mainly for icings or sprinkling on top of things -- however here [here being the Czech Republic], it is the sugar used for the baking of all fine cookies and pastry. All mothers and grandmothers used it and all recipes call for it. Some bakers even sift it to get the finest powder sugar. I think it blends with flour better. Since there is no liquid, the dough for these cookies is quite tough and it would probably take major effort in kneading to dissolve the rough-textured sugar. Finally I got a classic family recipe right -- well, almost right. While the cookies tasted great, the raw dough was quite crumbly and hard to work with. It may be a simple matter of using pastry flour instead of all-purpose, or adding a Tbsp more butter to the mix. Once I've perfected it, I'll post it in time for Christmas next year. Here is the recipe I used. 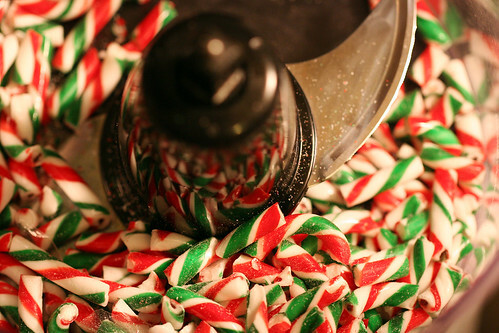 It consists of: 12 oz white chocolate, 12 oz dark chocolate and 48 mini candy canes. I was concerned about hurting my food processor with the candy canes, so I tried breaking them up with a rolling pin in a plastic bag. But that soon proved to be taking forever. Plus bits of plastic were starting to break off and candy cane dust was getting everywhere. So I poured it all in the food processor and pulsed it to pieces. 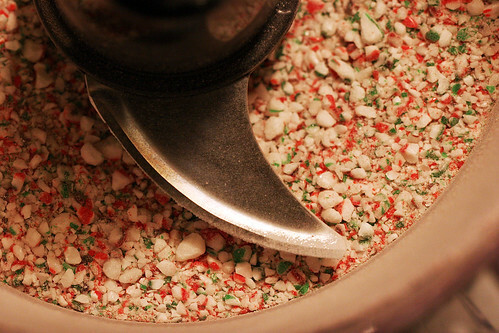 No food processors were harmed in the making of this candy cane dust. 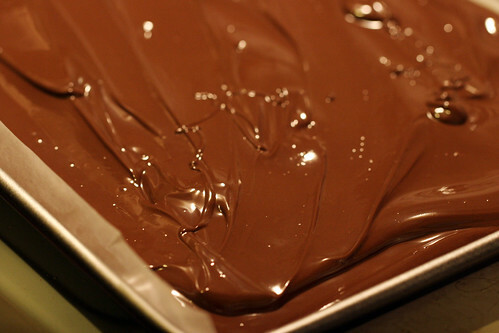 So once you have your candy cane dust ready, you melt the dark chocolate in a metal bowl on top of a simmering pot of water. 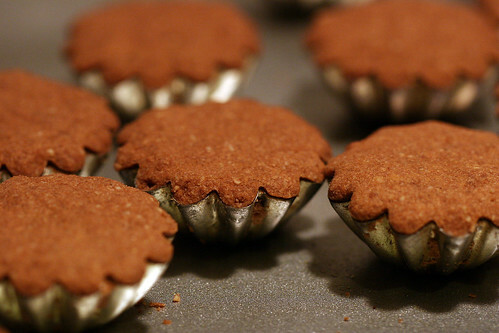 Pour it onto a wax paper-lined baking sheet and spread it out. Let it solidify in the fridge. 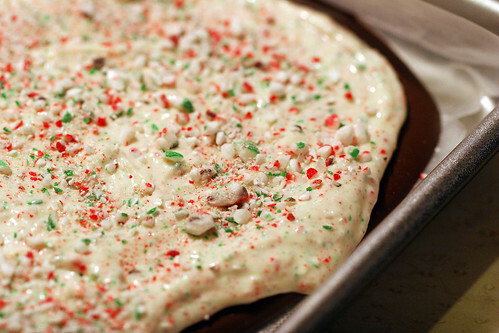 Then melt the white chocolate like you did the dark, and mix in 3/4 of the candy cane dust. 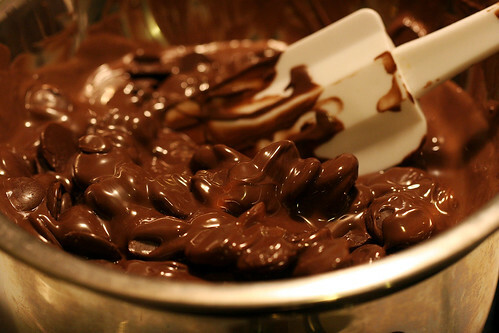 Spread the white chocolate mixture over the dark chocolate, and then sprinkle the rest of the candy canes on top. Back in the fridge with the whole lot, and once hardened, break it into small pieces of deliciousness. 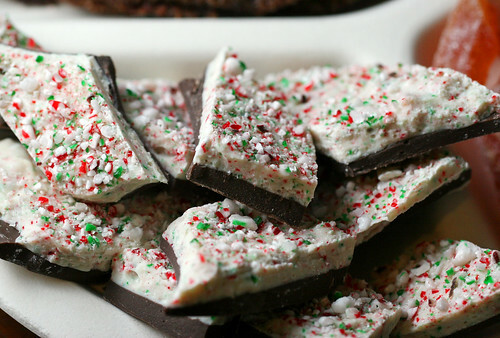 These Christmas treats look beautiful. I love your dad's notes on sugar. And that you're using your mom's Pracinky moulds. So pretty. Happy new year, Michelle! Hope you had a great Christmas. Thanks Jackie! Been thinking about you. Hope you had a good start to the new year! Talk soon.